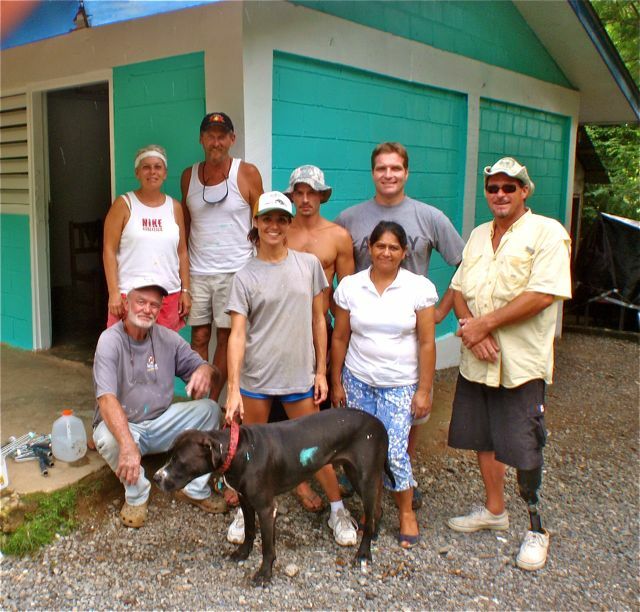 On Friday we painted a school in Jonesville, one of the original pirate settlements on Roatan. Last week we visited the school to drop off worming medications for the 54 students there, and while we were there we noticed that the school was in dire need of painting. 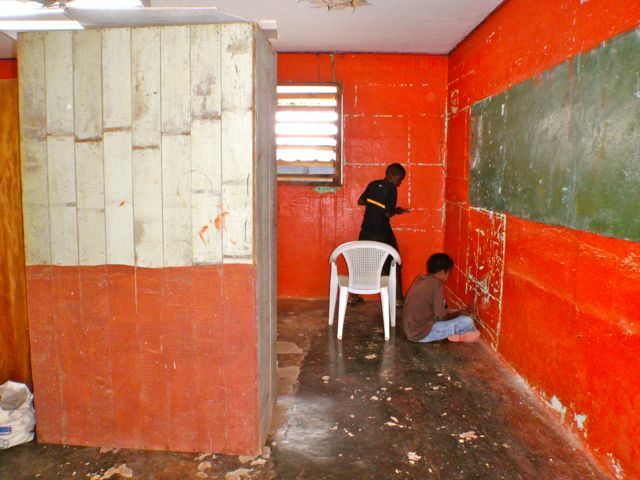 We spoke to Norma, the lady who runs the school, and offered to come back and paint it. We rounded up some help, got 10 gallons of paint from our friend Joseph’s foundation Intensive Heart Ventures, bought some primer and some brushes and rollers and headed back to paint the school the following week. It was perfect–Norma got the students to clear out the building, their session ended for the season, and we arrived at an empty building ready to prep and paint. helping us with our clinic), Larry (a longtime expat living in the neighborhood of the school), and four kids from French Harbor that have begun having around the boat. I love having them around; they remind me of Bichal and Yvenson and Jonas and our other young Haitian friends. Noah is always the one the kids gravitate to the most–as he is the most ferocious-looking, the young kids naturally hero-worship him wherever we go, so it is usually Noah that takes charge of the kids when they are working with us. Noah has a knack for connecting with the most at-risk kids, getting enormous influence with them right away and creating opportunities to provide them with tools and new ideas. Meanwhile, I can’t help trying to fill their heads with all kinds of random knowledge (being a teacher dies hard, and when I have them fishing out in the skiff I have a captive audience for the concepts of biology and ecology I’m constantly spouting to them). Sometimes stuff makes it through their burgeoning hormones and days later I overhear one of them telling another to throw a small fish back so it can grow bigger and have babies so when they catch it later it will be bigger, and there will be more of them. For me, those are great moments. 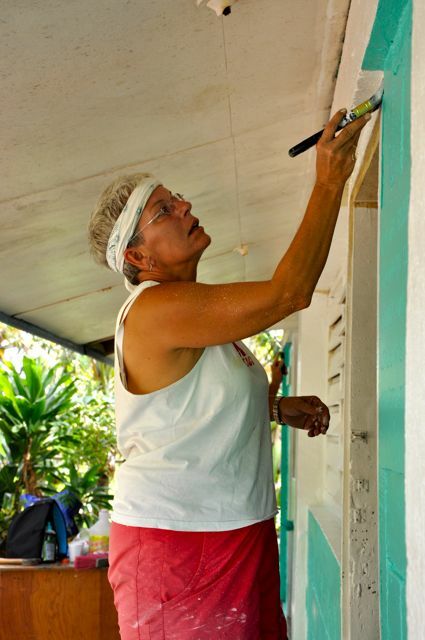 colors were covered by smooth new paint, I looked at the group that had assembled on a small peninsula on an island off the north coast of Honduras…a cruising couple, kids from a neighboring community, an expat, the local teacher, and us. So many people that might never have all been drawn together, all working together to do something for some kids they will probably never meet. That is one of my favorite aspects of our project…the connections created between people, and so many people doing what they can. The school got emptied and cleaned out by the students, and we repainted the whole school, inside and out in less than 5 hours with some touching up a few days later (ran out of paint and a few folks went back with new paint to finish up the last spots). I love that the same way our whole project was accomplished was the way the school got painted; the school was like a microcosm for our whole project: a lot of people from all walks of life all did a little (some did a LOT more than a little) and got it done. 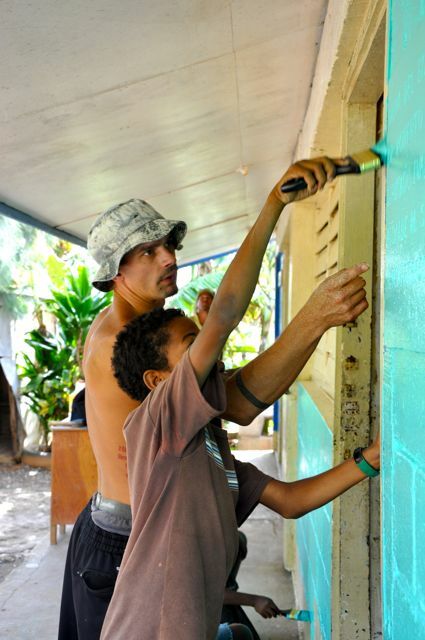 And continue to do so…thanks to everyone who helped us from day one to painting the school last Friday! MOOOOOOOM! 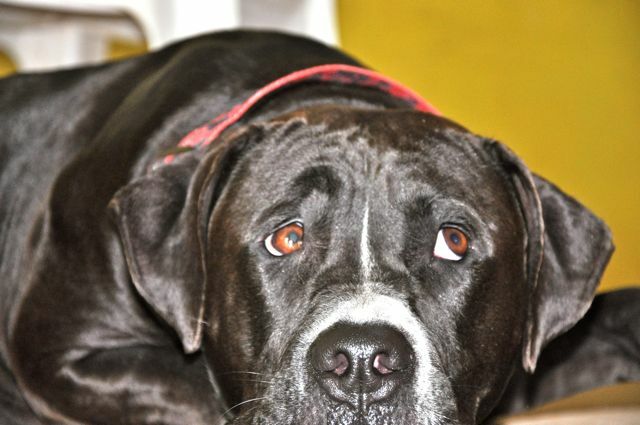 If you won't give me a sandwich then at least pay attention to me instead of painting!